Boynton Beach Police have arrested a man who they say impersonated a law enforcement officer. Officers responded to a trespassing call at a local Best Buy store, in which employees say John O’Grady was seen shoplifting several days earlier and stole an iPhone 10, according to a police report. 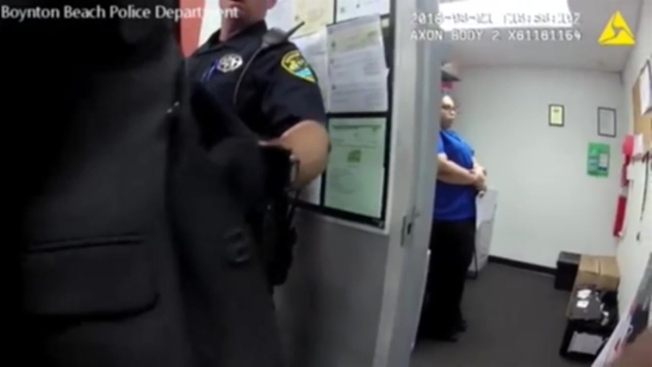 When officers approached O’Grady, they noticed a US Marshals pin attached to his business suit and asked if he was a law enforcement officer. O’Grady responded by saying he was a US Marshal. Officers searched O’Grady and found a firearm that turned out to be a BB gun, and what appeared to be an authentic US Marshals badge attached to his belt in the front of his pants. O’Grady told officers that he was in fact not a US Marshal and that his firearm was fake when they asked for his supervisor’s name. "Congratulations, that's a felony," said one of the officers on bodycam footage of the incident. Authorities also found another Deputy US Marshal badge and a white iPhone X in O’Grady’s car that store employees say matches the serial number of the device stolen days earlier. O’Grady was taken into custody and now faces charges of impersonating a law enforcement officer and retail grand theft.